Exeter Chiefs came from behind to earn a 31-14 bonus point European Rugby Champions Cup victory over Clermont Auvergne at Sandy Park. Exeter trailed 10-14 at half time but delivered a sensational second half performance that saw them outscored their French opponents by 21 point to 0. 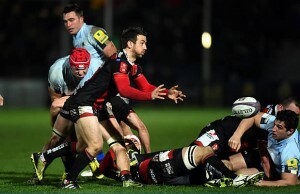 Clermont made an explosive start to the match and even led the Chiefs by 14 points to 3. 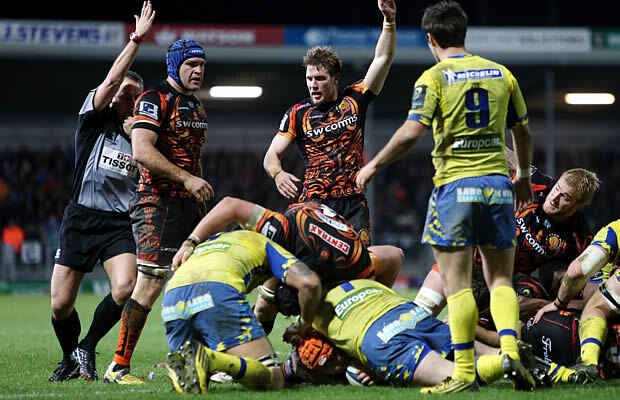 Clermont looked to be ready to repeat the 46-12 hammering they dished out the last time the two sides met at Sandy Park in 2012 when they raced into the lead after just 20 minutes. But a try in each half from Thomas Waldron and two late scores from Don Armand and Mitch Lees completed a famous comeback to blow the race for qualification from pool two wide open. 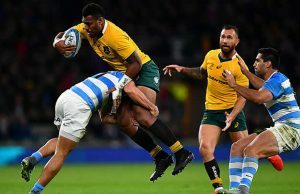 The Chiefs thought they had scored inside five minutes when they rumbled over from a driving maul but the referee and TMO decided they could not see if the ball had been grounded. Clermont capitalised on the set back and hit the home side with two quick tries through Joe Gear and Aurelien Rougerie, with Morgan Parra adding the conversions to both scores. But Exeter hit back with Waldrom’s first try to and a conversion and earlier penalty from Gareth Steenson brough the home side to within four points at half-time. Chiefs went down to 14 men with 15 minutes left on the clock when Phil Dollman was sent to the bin for killing the ball at a ruck but five minutes later Clermont’s Peceli Yato joined him for a swinging arm on Will Chudley. In the final quarter the the home side peppered the Clermont line and finally got a breakthrough seven minutes from time when Don Armand powered over after more excellent work from the Chiefs pack. Baxter’s side then then wrapped up a famous win with a fourth try in the final minute of the match when Mitch Lees charged under the posts to secure the bonus-point. Double try scorer Thomas Waldrom was named European Rugby Champions Cup man of the match.